I am fundraising to build a boarding school for underprivileged tribal women in Jharkhand. Support my cause! Hi, my name is Santosh. I am a volunteer for Yuwa India for its ground work in addressing social issue. I was born in Jharkhand and have seen its grass root problems first-hand. The social system has not evolved, women are forced to enter child marriages, human trafficking is widely prevalent. Yuwa uses football as a platform to combat child marriage and human trafficking in India. Through football, Yuwa provides a platform for young women to gain confidence and skills to make positive changes in their lives. Yuwa’s girls have inspired tens of millions of people throughout India and around the world with their achievements. 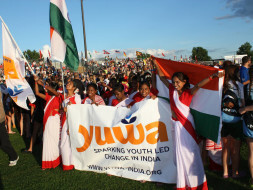 Yuwa uses football and education as mechanisms to empower girls in the poorest of communities in Jharkhand – a unique model that has worked with demonstrated results for more than 5 years. Yuwa brings girls out of isolation and into a positive team environment, building confidence, a strong sense of community and a model for self-improvement. Through positive peer-pressure from coaches, captains and team-mates, girls’ school attendance soars. Football serves as a powerful platform to combat challenges faced by young women in Jharkhand including child marriage, illiteracy and human trafficking. We’ve learned the hard way that tossing good students in Yuwa into good schools doesn't work. They don't yet have the English language skills to cope. And with 50-70 kids for each teacher, the quality of the Hindi medium schools here hovers between poor and absolutely awful. Government schools in Jharkhand rank among the lowest in India with an average of 4.3 teachers per school. Where will the funds be used? The funds collected will be used for construction of a boarding school which will house the women. The school will be their second home where they will have access to quality education, and healthy food.